Last week, as our team in Mexico served families affected by flooding due to heavy rains at the beginning of January, they met Irma and her mother. Irma has been housebound since the flood, as she has limited mobility due to Spinal Bifita. She has experienced much hardship because of her special needs. One of our team members asked her if she would be willing to share their experience in the flood with our supporters. Her account below, in her own words, demonstrates faith in God in the midst of an incredibly terrifying situation. Irma speaks good English so aside from slight editing, these are her words. 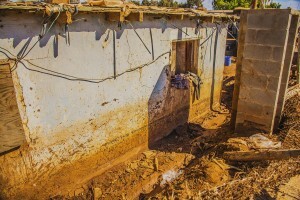 “It was January 4th, the first week of the year and the rain started to fall just as normal, but on the sixth day of that month, the rain was more intense, and the “canal” in this area got full and the water started to go all over the houses. “It was late at night and all of a sudden it was surrounding the place. My mother was so scared and nervous, we (at least me) thought it was the end of the world and would die, but we moved during the event. I had to walk in the cold, dirty water to move over to other place by my mother’s hand. I was dying of being scared, but I knew she would never let go of my hand. We got safe to other house, it was good but not like home. “During all of this, my mom was crying desperately, so I had to comfort her and prayed about God giving her peace (which kind of didn’t work cause at every drop she cried, now we laugh at it). I was quietly crying but had to be strong enough to her and be there for her just as she is when I need her and yes, the next day we had a dirty, sunny day, no more rain!! 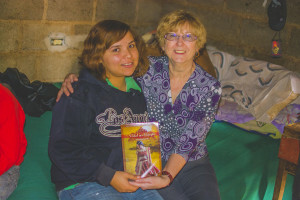 “I honestly have to share this: the flood helped me to build a stronger relationship mother-daughter and God-child. It was really nice to see that my mom has always been there for me and God is always there so if I fall, God is my springboard/trampoline and my mother will always have my back. Irma and Sallyanne Calver One of the many houses affected by the flood.